This week, something different. I'm experimenting with style. Thoughts? If you like it, please help me out by sharing to your facebook etc. The Final TillyCam - Part 7 of 7 - Rainforest. Very cool! I really liked that pic of the skull too! Sorry it's taken me a while to get caught up with your posts. I've been a little busy but I'm caught up now! Great job! I'll be back soon. Accurate description on the dreaded C!! An insidious disease!! Pretty cool, Anthony. I'm wondering how you did that (a good sign). Very good Anthony! Much too technical for me! so what exactly is the story on that skull? Cheers guys. This one took me a while to do. A lot of editing etc. The skull is a real object: Look up Very Hungry God, which I beleive is in Venice at the moment. It's pretty amazing. 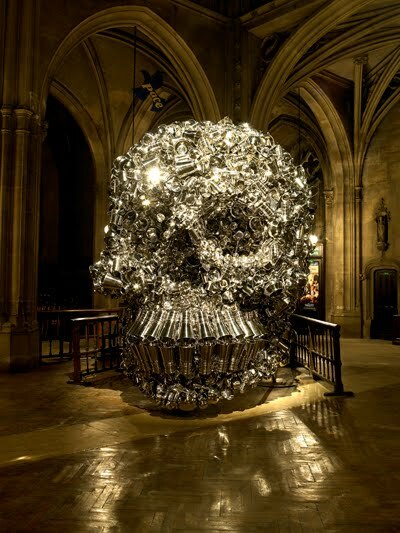 The artist has created similiar work out of metal etc. I F*%king LOVED that! I don't know what else to say. Awesome energy... I can see me refering back to that at a time I'm angry about my body! P.S. didn't vote in your poll as no answer reflected my view that it's none of my business about me whether someone is a good/bad artist, writer, singer etc. That's the whole point of art isn't it? excellent! but i prefer the one before. About the pol, How does one define a bad artist??? Likes and dislikes comes from diversity. At least, that's the way i see it! Hugs!